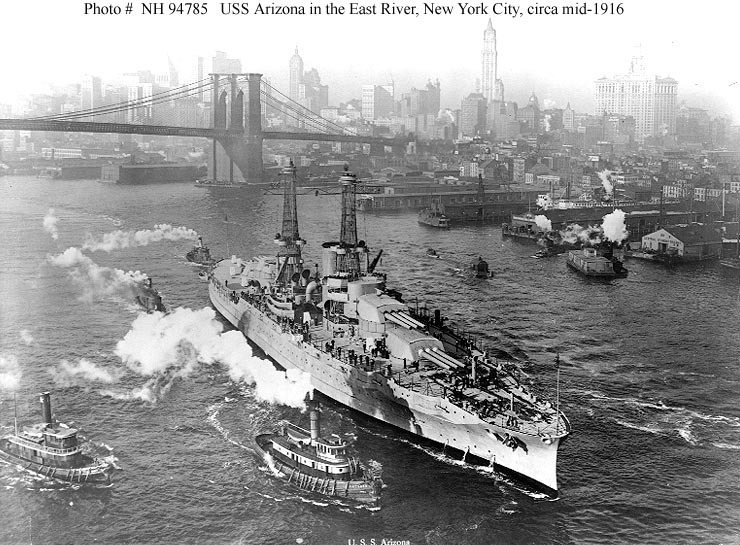 USS Arizona, a 31,400 ton Pennsylvania class battleship built at the New York Navy Yard, Brooklyn, New York, was commissioned in October 1916. 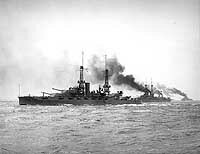 After shakedown off the east coast and in the Caribbean, she operated out of Norfolk, Virginia, until November 1918, when she made a brief cruise to France. She made a second cruise to European waters in April-June 1919, proceeding as far east as Turkey. 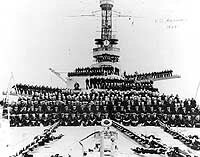 During much of 1920-21, the battleship was in the western Atlantic and Caribbean areas, but paid two visits to Peru in 1921 in her first excursions into the Pacific. 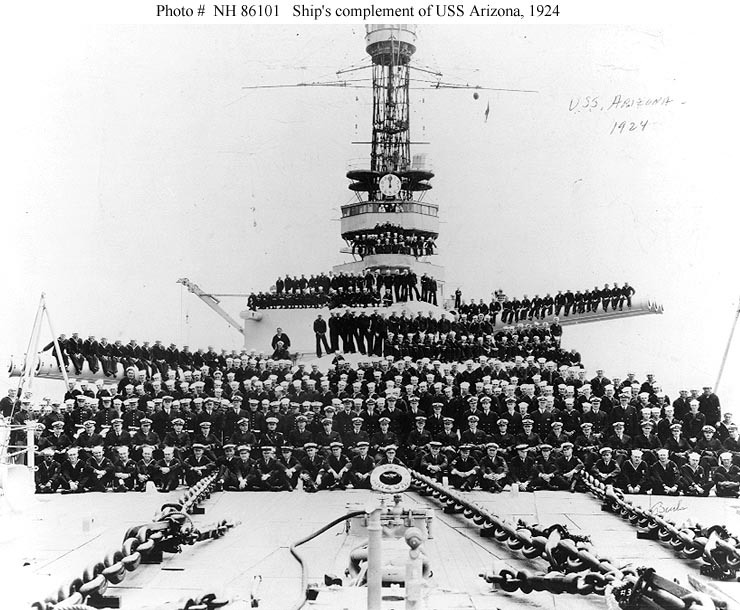 From August 1921 until 1929, Arizona was based in Southern California, making occasional cruises to the Caribbean or Hawaii during major U.S. Fleet exercises. 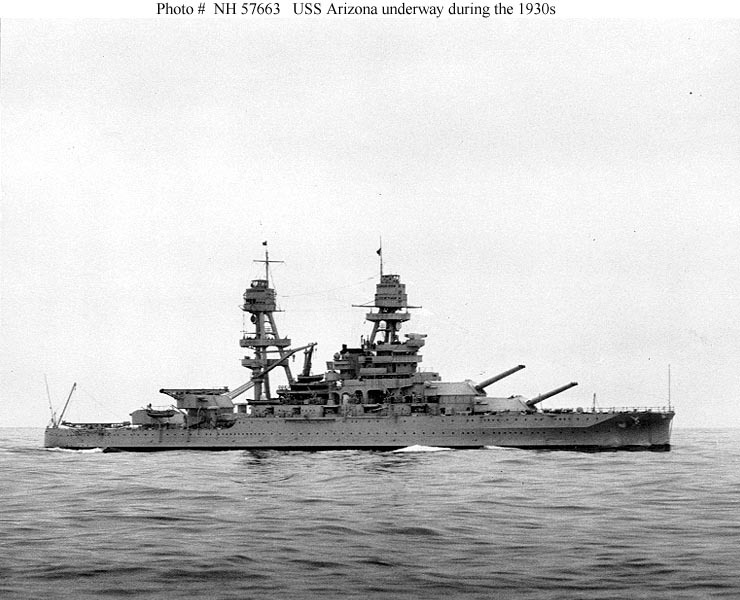 In 1929-31, Arizona was modernized at the Norfolk Navy Yard, Portsmouth, Virginia, emerging with a radically altered appearance and major improvements to her armament and protection. In March 1931, she transported President Herbert Hoover and his party to Puerto Rico and the Virgin Islands. 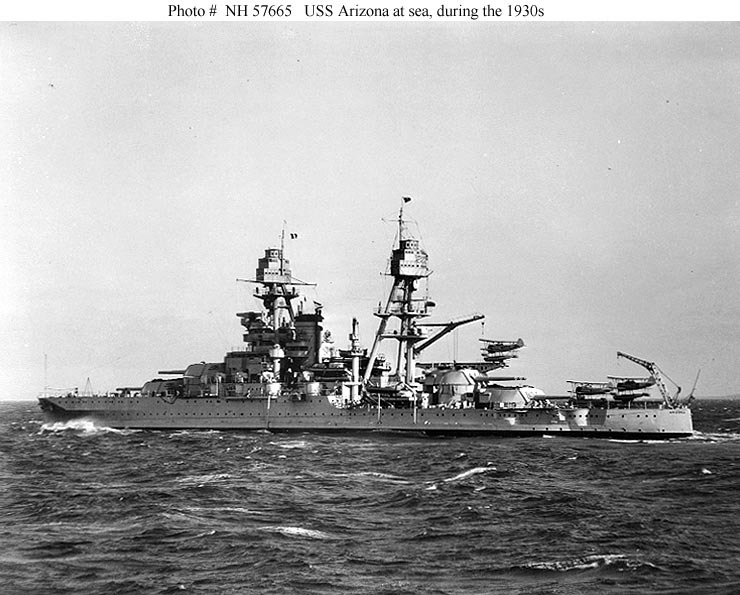 In August of that year, Arizona returned to the Pacific, continuing her operations with the Battle Fleet during the next decade. 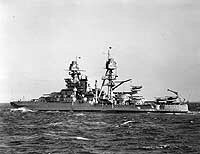 From 1940, she, and the other Pacific Fleet battleships, were based at Pearl Harbor on the orders of President Franklin D. Roosevelt. 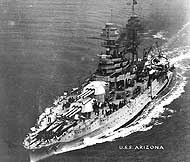 Arizona was moored in Pearl Harbor's "Battleship Row" on the morning of 7 December 1941, when Japanese carrier aircraft attacked. 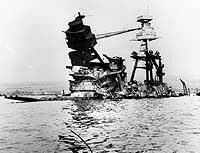 She was hit by several bombs, one of which penetrated her forecastle and detonated her forward ammunition magazines. 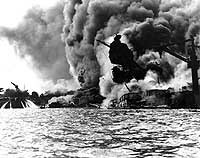 The resulting massive explosion totally wrecked the ship's forward hull, collapsing her forward superstructure and causing her to sink, with the loss of over 1100 of her crewmen. 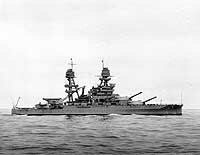 In the following months, much of her armament and topside structure was removed, with the two after triple 14" gun turrets being transferred to the Army for emplacement as coast defense batteries on Oahu. The wrecked battleship's hull remained where she sank, a tomb for many of those lost with her. In 1950, she began to be used as a site for memorial ceremonies, and, in the early 1960s a handsome memorial structure was constructed over her midships hull. This USS Arizona Memorial, operated by the National Park Service, is a permanent shrine to those Americans who lost their lives in the attack on Pearl Harbor and in the great Pacific War that began there. 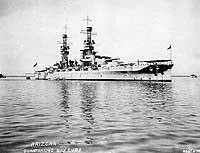 This page features selected views of USS Arizona (BB-39). Salvage Work on USS Arizona, 1942-1943. USS Arizona Memorial, Pearl Harbor, Hawaii. In the East River, New York City, at the time of her trials, circa mid-1916. She is accompanied by many tugs, and has small pine trees mounted in her mast tops. Tug Hudson is in the lower center. Photographed by Enrique Muller, Jr. Courtesy of Sid Taylor, 1983. 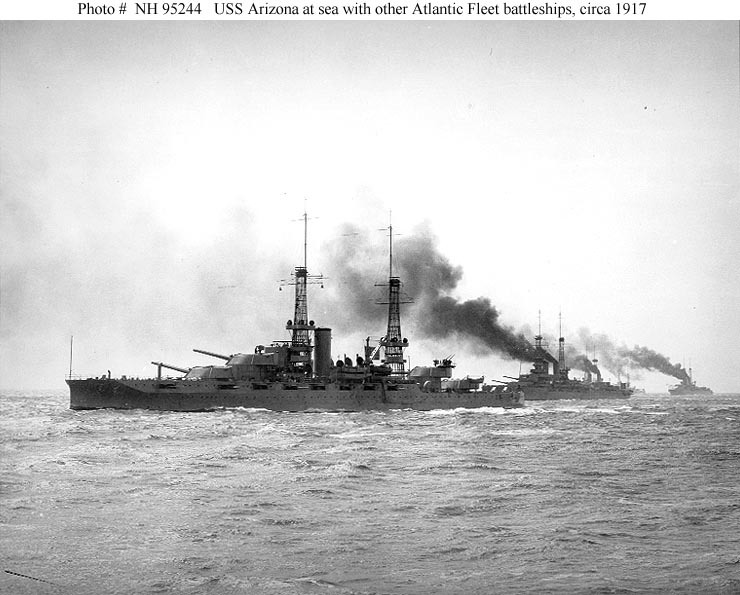 Steaming in formation with other Atlantic Fleet battleships, during gunnery practice, circa 1917. Courtesy of H.E. Coffer, 1983. 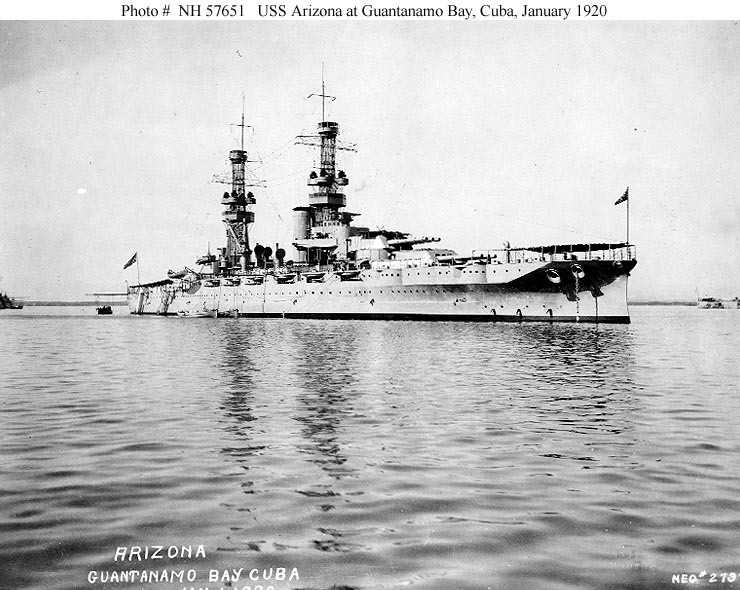 Anchored in Guantanamo Bay, Cuba, 1 January 1920. 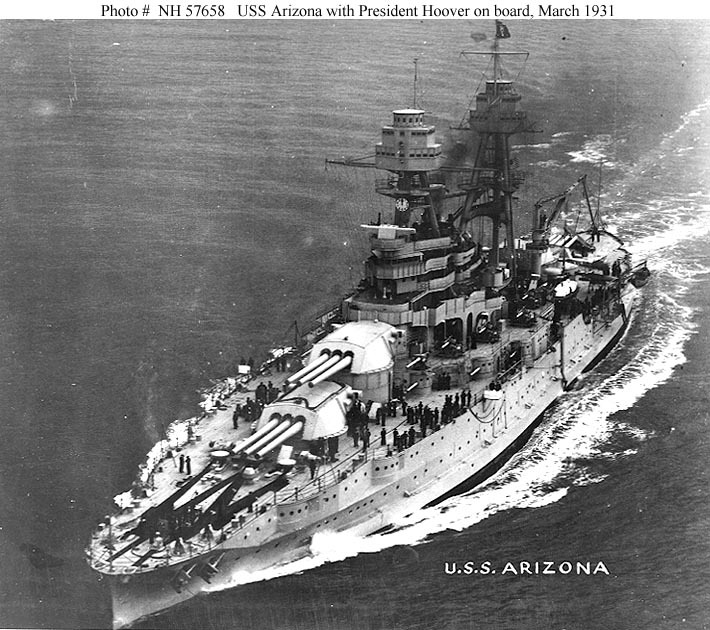 Underway with President Herbert Hoover on board, March 1931. The Presidential Flag is flying from her mainmast peak. 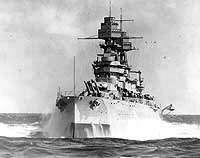 Steaming at sea during the 1930s, with her main battery 14"/45 guns trained to port. Pitching in heavy seas during the 1930s. Ship's complement posing on her forecastle, forward turrets and superstructure, circa 1924. The officer seated in the second row, 4th from right, is Ensign Arleigh A. Burke. Collection of Admiral Arleigh A. Burke, USN, 1977. 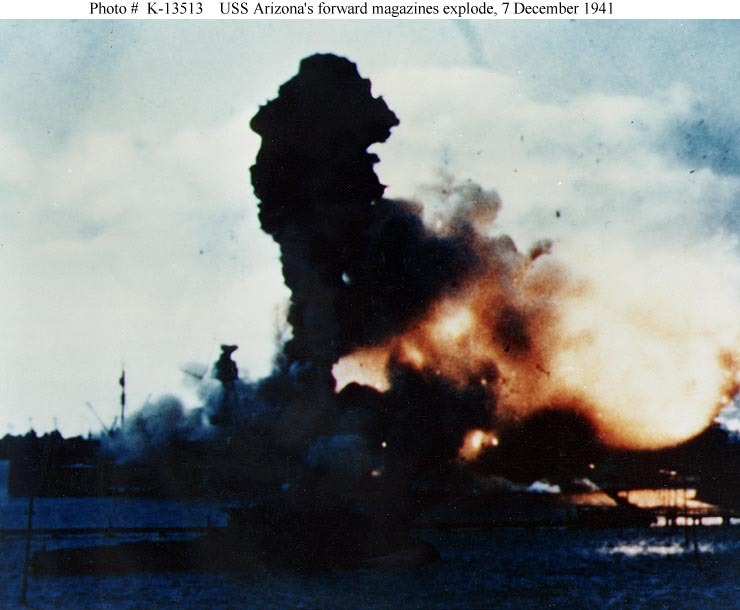 The forward magazines of USS Arizona (BB-39) explode after she was hit by a Japanese bomb, 7 December 1941. Frame clipped from a color motion picture taken from on board USS Solace (AH-5). Note: The motion picture from which this image is taken has been, and continues to be, shown backwards, with the fireball oriented to the left. The image is correctly oriented as shown here. 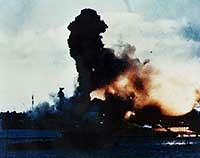 USS Arizona (BB-39) sunk and burning furiously, 7 December 1941. 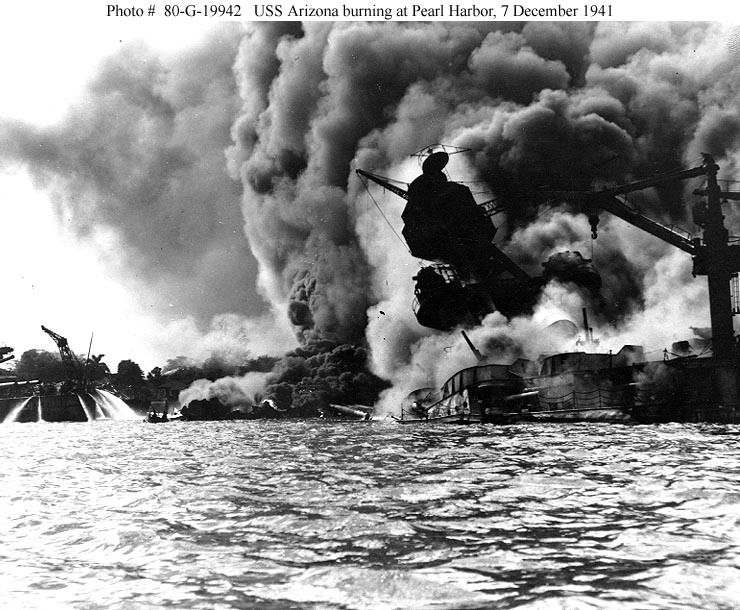 Her forward magazines had exploded when she was hit by a Japanese bomb. 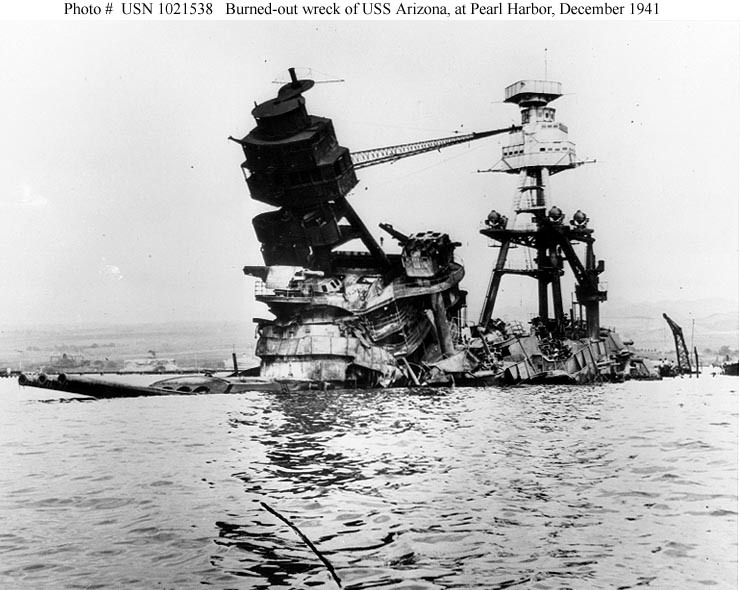 The burned-out, sunken wreck of USS Arizona (BB-39), photographed some days after the attack.